Is it to late to start Montessori with your older child? 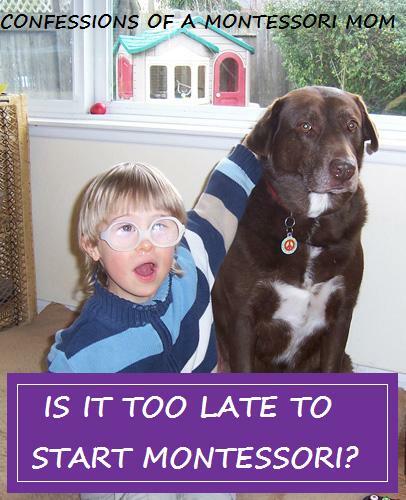 I've been asked this question--Is it too late to start Montessori with my older child? several times over the years! Usually when a mom asks me this question, she tells me she is not happy with the local public school, or her child is not doing well in public school, and that she has heard great things about Montessori, but feels it is too late to start it at home (to Montessori homeschool). Or sometimes she has already started homeschooling using more traditional methods, but it is not working out very well with her older child. 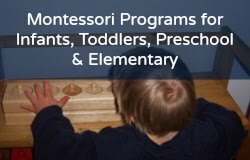 Some moms have read books on Montessori and realize their child has missed out on the foundation of the Montessori preschool years. These moms are in a quandary as to what to do! So they come to me because they trust my judgement and wisdom! I am a mom, too, after all. You can worry yourself sick trying to figure out the best educational choices for your child! And boy do I know the feeling! I think about the best educational choices for my son ALL THE TIME due to his Down syndrome! When he was only 3 1/2 I was already thinking about high school! I think you can begin Montessori homeschooling at any age, and the 6-9 curriculum offers a lot of choices for math, language, history, and the sciences, choices that are superior to traditional approaches. The "foundation" will be different since you are starting a little (or a lot) late, and this is not uncommon. I always tell homeschoolers getting a late start (using Montessori) not to dwell on it! You want your children to love learning, that should always be your bottom line! Always! What many homeschoolers do is use Montessori along with OTHER homeschool curriculum... and you may want to consider this for your six- to nine-year-old. So I guess what I'm saying is, it doesn't have to be all or nothing! Be open to whatever you find "out there" for your children, including Montessori!